Sialic acid–binding, Ig-like lectin (Siglec)-F is highly expressed on mouse eosinophils and plays an important role in regulating levels of eosinophilic lung inflammation. In this study we investigated the mechanism of constitutive and inducible Siglec-F ligand expression by lung airway epithelial cells and inflammatory cells in wild-type (WT) and genetically altered mice (ST3Gal-III heterozygotes, Fuc-TIV/VII double null, STAT6 null). Flow cytometry demonstrated that Siglec-F ligands are constitutively expressed in vitro and in vivo in selected lung cell types (epithelial cells, eosinophils, macrophages, and mast cells, but not CD4, CD8, or B cells) and are induced in response to divergent stimuli, including innate stimuli (TLR ligands, Alternaria), Th2 cytokines (IL-4, IL-13), and adaptive immune stimuli (OVA allergen). Furthermore, studies of deficient mice demonstrated the greater importance of the sialyltransferase ST3Gal-III compared with fucosyltransferases Fuc-TIV/VII in the synthesis of the constitutive and inducible Siglec-F ligands by lung epithelial and nonepithelial cells. In keeping with this, ST3Gal-III heterozygote mice (deficient in expression of Siglec-F ligands) also had significantly enhanced OVA-induced eosinophilic airway inflammation associated with reduced eosinophil apoptosis. 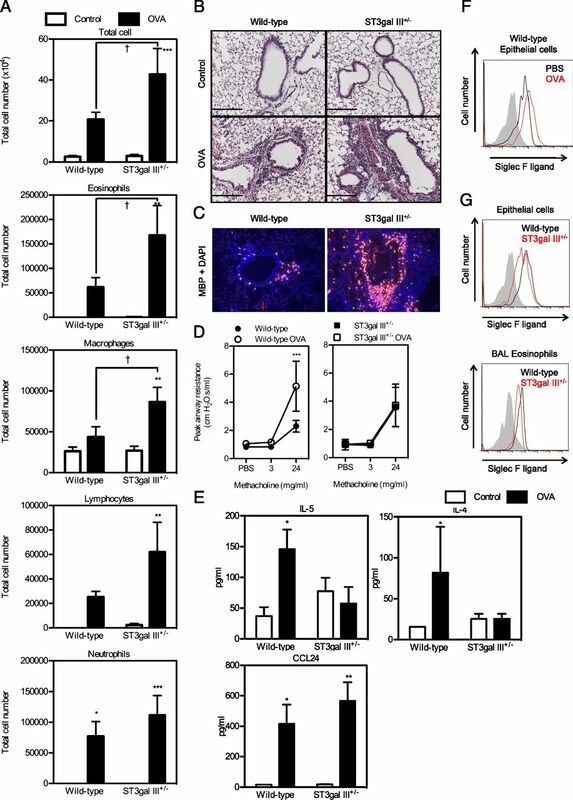 Reduced eosinophil apoptosis in the lung of ST3Gal-III–deficient mice is likely mediated by reduced epithelial expression of Siglec-F ligands as WT eosinophils (which highly express Siglec-F) cultured with ST3Gal-III–deficient epithelial cells (which do not express Siglec-F ligand) showed reduced eosinophil apoptosis compared with WT eosinophils cultured with WT epithelial cells. Overall, these studies demonstrate that ST3Gal-III plays an important role in Siglec-F ligand formation and eosinophil apoptosis with resultant effects on eosinophilic inflammation in the lung. Sialic acid–binding, Ig-like lectins (Siglecs) are a family of single-pass type I transmembrane receptors that are found predominantly on innate immune cells (1). Among CD33-related Siglecs, Siglec-F is highly expressed on eosinophils (2). Siglec-F possesses an ITIM that can mediate inhibitory functions, including induction of eosinophil apoptosis (3–8). The importance of Siglec-F in regulating levels of eosinophilic inflammation in vivo has been demonstrated in studies of Siglec-F–deficient mice (4), as well as in studies of wild-type (WT) mice administered anti–Siglec-F Ab in models of eosinophilic inflammation (5). Studies have also investigated expression of Siglec-F ligands. Siglec-F binds preferentially to α-2,3-linked sialic acids, including 6′-sulfated sialyl Lewis X (6′-sulfo-SLex), suggesting that it is the best glycan ligand for Siglec-F (9). Using immunohistochemistry, we previously reported that Siglec-F ligands are expressed on bronchial epithelium, and that expression is upregulated on both bronchial epithelium and peribronchial inflammatory cells upon OVA allergen challenge (4). Additionally, Th2 cytokines, IL-4 and IL-13, induce upregulation of Siglec-F ligand expression on airway epithelial cells following in vivo administration (10). In this study, we have used ST3Gal-III heterozygous–deficient and Fuc-TIV/VII–deficient mice to examine Siglec-F ligand synthesis, as these enzymes have been implicated in the synthesis of the tetrasaccharide 6′-sulfo-SLex, a Siglec-F ligand (11, 12). Biosynthesis of a sulfated, sialylated Lewis X structure would require a disaccharide substrate (a terminal precursor N-acetyllactosamine, Galβ1–4GlcNAc) and the action of three enzymes, including a sulfotransferase, a sialyltransferase, and a fucosyltransferase (11). In terms of the fucosyltransferase, only two fucosyltransferases in mice (Fuc-TIV or Fuc-TVII) are known to be able to synthesize 6′-sulfo-SLex, and Fuc-TIV is highly expressed in airway epithelial cells, the site where we have noted constitutive and inducible expression of Siglec-F ligands (13). α-2,3-sialyltransferases must also be involved in the synthesis of 6′-sulfo-SLex to catalyze the transfer of sialic acid to an acceptor glycan (14–16). Of the six known α-2,3-sialyltransferases in mice, ST3Gal-II, -III, -IV, and -V are noted to be expressed in lungs (17). Additionally, ST3Gal-III, -IV, and -VI are known to sialylate type II (Galβ1-4GlcNAc) oligosaccharides in vitro, consistent with involvement in the formation of 6′-sulfo-SLex (18, 19). Guo et al. (20) recently reported a role of ST3Gal-III in constitutive expression of Siglec-F ligands in mouse lungs using immunohistochemistry, but did not investigate their role in Siglec-F ligand expression induced by allergen, nor the effect of ST3Gal-III deficiency on allergen-induced levels of lung eosinophilic inflammation in vivo. In this study, we demonstrate the greater importance of ST3Gal-III compared with Fuc-TIV/VII in the synthesis of constitutive Siglec-F ligand synthesis in lung epithelial and nonepithelial cells (eosinophils, macrophages, mast cells). Moreover, ST3Gal-III–deficient mice (deficient in expression of Siglec-F ligand) had significantly enhanced OVA allergen–induced eosinophilic airway inflammation associated with reduced eosinophil apoptosis. C57BL/6 mice, ST3Gal-III+/− (hereafter referred to as ST3Gal-III–deficient) mice, and STAT6−/− mice on a C57BL/6 background were purchased from The Jackson Laboratory (Bar Harbor, ME), whereas Fuc-TIV−/−/VII−/− mice were provided by Dr. J.B. Lowe (21). All animals were kept under specific pathogen-free conditions in an environmentally controlled clean room at the University of California, San Diego. All animal experimental protocols were approved by the University of California, San Diego Animal Subjects Committee. We investigated the effect of an adaptive immune stimulus (OVA), an innate immune stimulus (Alternaria), and Th2 cytokines (IL-4, IL-13) on induction of Siglec-F ligand expression by lung epithelial and nonepithelial cells. Mice were sensitized with OVA (Sigma-Aldrich, St. Louis, MO) as previously described (22). In brief, mice were sensitized i.p. with 100 μg OVA and 2 mg aluminum hydroxide (Imject Alum; Thermo Fisher Scientific, Waltham, MA) in a total volume of 200 μl PBS on days 0 and 10 followed by intranasal administration of 200 μg OVA in 20 μl PBS on days 21, 23, and 25. Control groups of mice were sensitized and challenged with PBS only. Twenty-four hours after the last challenge, bronchoalveolar lavage (BAL) fluid, lungs, blood, and bone marrow were collected as previously described (23). The total number of BAL cells was counted and BAL differential cell counts were quantitated on cytospun slides stained with May–Grünwald/Giemsa. Naive WT or STAT6−/− mice were intranasally challenged once with 100 μg/mouse of Alternaria alternata extract (Greer Laboratories, Lenoir, NC) in 80 μl PBS, or control PBS, and sacrificed 24 h after the challenge. This protocol induces a robust innate eosinophil response within 24 h that is not dependent on adaptive immune responses as in the OVA protocol (24). Mice were challenged intranasally once with 0.6 μg either recombinant murine (rm)IL-4 or rmIL-13 (R&D Systems, Minneapolis, MN) in 40 μl PBS or control PBS and sacrificed 24 h after the challenge. Twenty-four hours after the last challenge, lungs were harvested and fixed in 4% paraformaldehyde (Electron Microscopy Sciences, Hatfield, PA). The fixed tissues were embedded in paraffin and sliced into 5-μm sections, followed by either H&E staining to assess peribronchial inflammation or immunostaining to detect eosinophils and apoptotic eosinophils. For major basic protein (MBP) immunostaining, an anti-mouse MBP Ab (provided by Dr. James Lee, Mayo Clinic, Scottsdale, AZ) and the immunoperoxidase method were used followed by DAPI staining as previously described (6). For some experiments, TUNEL staining was combined with MBP immunostaining to detect apoptotic eosinophils. For TUNEL staining, TdT was used to catalyze polymerization of labeled nucleotides to free 3′-OH DNA ends of apoptotic cells as described by the manufacturer (Roche Applied Science, Mannheim, Germany). As a negative control in the TUNEL assay, the enzymatic reaction with TdT was omitted, and as a positive control, lung sections were incubated with DNase I (Roche Applied Science) to induce DNA strand breaks prior to the labeling process. Lung sections were scanned using a Leica DM2500 (Leica Microsystems, Wetzlar, Germany). Images were captured and analyzed using Image-Pro Plus (Media Cybernetics, Bethesda, MD). To obtain lung single-cell suspensions, lungs were minced and agitated vigorously in RPMI 1640 with 2 mg/ml collagenase D (Roche Applied Science) and 1 mg/ml DNAse I (Roche Applied Science) for 30 min at 37°C. Lung single cells were isolated using a 70-μm cell strainer and used for flow cytometry. The levels of IL-4, IL-5, and CCL24 in BAL fluid were determined using respective mouse IL-4, IL-5, and CCL24 DuoSets (R&D Systems), which each have a sensitivity of 7 pg/ml. Mouse primary airway epithelial cell isolation was performed as previously described (25). In brief, mouse tracheas were aseptically removed and digested with 1.4 mg/ml pronase (Roche Applied Sciences) and 0.1 mg/ml DNase I (Sigma-Aldrich) in calcium- and magnesium-free MEM overnight. The single tracheal cells recovered were incubated at 37°C for 3 h in complete medium (DMEM/F12, 120 mU/ml insulin, and 1× nonessential amino acids) to remove fibroblasts that attach to the culture dish. The nonadherent cells were collected and transferred to collagen-coated plates (BD BioCoat collagen I cellware; BD Biosciences, San Jose, CA) and incubated in serum-free PCT airway epithelial medium (CnT-17; CELLnTEC Advanced Cell Systems, Switzerland) until they reached the desired confluency. Cultured epithelial cells were detached from the culture plates with prewarmed trypsin-EDTA for 10 min prior to analysis by flow cytometry. To assess the purity of cytokeratin-positive epithelial cells in the cultures, cells grown on an eight-well slide (VWR International, Radnor, PA) were fixed with cold acetone and incubated with 2 μg/ml rabbit anti-cytokeratin or control Ab (Santa Cruz Biotechnology, Santa Cruz, CA) and detected with the alkaline phosphatase method (Vector Laboratories, Burlingame, CA). In some experiments, mouse peripheral blood leukocytes (1–4% eosinophils) were cocultured with mouse primary epithelial cells isolated as described above. Briefly, after epithelial cells grown in 24-well culture plates reached full confluency, the wells were washed with PBS, and WT blood leukocytes in RPMI 1640 medium supplemented with 10% FCS were coincubated. Twenty-four hours later, the number of apoptotic and viable eosinophils were counted by FACS. For eosinophil apoptosis detection by flow cytometry, cells were stained with FITC-conjugated anti-CCR3 to distinguish eosinophils and then stained with allophycocyanin-conjugated annexin V and propidium iodide (annexin V apoptosis detection kit; eBioscience, San Diego, CA) according to the manufacturer’s instructions. To investigate regulation of Siglec-F ligand expression on epithelial cells, we used a murine lung epithelial cell line (MLE12; American Type Culture Collection, Manassas, VA). MLE-12 cells (1 × 105/ml) were incubated with or without 10 mU/ml sialidase (Roche Applied Sciences) in 24-well culture plates for 24 h. Sialidases hydrolyze α-glycosidic linkages of terminal sialic residues in structures such as 6′-sulfo-SLex, the ligand for Siglec-F, and would thus remove any constitutive Siglec-F ligand expressed. Epithelial cells were then stimulated with either Th2 cytokines, that is, 10 ng/ml rmIL-4 (R&D Systems) or 10 ng/ml rmIL-13 (R&D Systems); TLR ligands, that is, 10 μg/ml CpG (TriLink, San Diego, CA), 100 ng/ml LPS (Sigma-Aldrich), or 100 ng/ml Pam3 (Sigma-Aldrich); or 10 ng/ml rmGM-CSF (R&D Systems), 10 ng/ml rmIL-10 (R&D Systems), or 10 ng/ml rmIL-17 (R&D Systems) for 0, 1, 3, 6, or 12 h. Cells were trypsinized and collected for FACS detection of Siglec-F ligand expression as described below. Siglec-F ligand expression on lung epithelial cells, inflammatory cells (eosinophils, macrophages, mast cells, neutrophils), and immune cells (CD4+ cells, CD8+ cells, B cells) was analyzed by flow cytometry. Individual cell types in these lung single-cell digests and peripheral blood were not purified prior to FACS analysis. Briefly, lung cells (single-cell suspensions, primary epithelial cells, or MLE12 cell line) were first incubated with a mAb to CD16/CD32 (clone 24G.2) for 10 min to block Fc receptors. Cells were then stained with either 1 μg/ml recombinant Siglec-F human IgG Fc fusion protein (R&D Systems) or control human IgG at 4°C for 30 min followed by staining with 0.5 μg/ml PE-conjugated goat anti-human IgG (eBioscience, San Diego, CA) with cell-specific markers indicated below at 4°C for 30 min. For lung cells, cells were stained with PerCP-conjugated anti-CD45.2 mAb to distinguish hematopoietic cells from other cell types. For mouse primary epithelial cell identification, cells were fixed and permeabilized by a BD Cytofix/Cytoperm fixation/permeabilization kit (BD Biosciences) as instructed by the manufacturer and stained with 2 μg/ml rabbit anti-cytokeratin Ab (Santa Cruz Biotechnology) followed by staining with FITC-conjugated goat anti-rabbit IgG (eBioscience). CD45.2−cytokeratin+ cells were gated as epithelial cells and further analyzed for Siglec-F ligand expression. Similarly, CD4+ T cells stained positive for both CD45.2 and FITC-conjugated CD4 (clone RM4-5; eBioscience). CD8+ T cells stained positive for both CD45.2 and FITC-conjugated CD8 (clone 53-6.7; BD Biosciences). Mast cells stained positive for CD45.2, FITC-conjugated anti-FcεRI (clone MAR-1; eBioscience), and Alexa Fluor 647–conjugated CD117 (clone 2B8; Life Technologies, Grand Island, NY). Neutrophils stained positive with CD45.2 and allophycocyanin-conjugated anti–Gr-1 (clone RB6-8C5; eBioscience). Macrophages were autofluorescent and stained positive for CD45.2 and allophycocyanin-conjugated CD11c (clone N418; eBioscience). B cells stained positive with CD45.2 and biotinylated anti-B220 (clone RA3-6B2; eBioscience) followed by streptavidin-allophycocyanin. Eosinophils stained positive for FITC-conjugated anti-CCR3 (clone 83101; R&D Systems) or Alexa Fluor 647–conjugated anti-CCR3 (clone 83103; BD Biosciences). In selected experiments Alexa Fluor 488–conjugated anti-mouse IL-5 receptor Ab (clone T21; BD Biosciences) was used to analyze IL-5 receptor expression on PE-conjugated anti-Siglec F (clone E50-2440; BD Biosciences)–positive and allophycocyanin-conjugated anti-CD11c–negative cells. Stained cells were analyzed using an Accuri C6 flow cytometer (Accuri Cytometers, Ann Arbor, MI) and analyzed with FlowJo software (Tree Star, Ashland, OR). Total RNA was extracted from purified populations (>95% pure) of epithelial cells (MLE-12) and nonepithelial cells (macrophages, eosinophils). For this experiment macrophages were derived from culture of mouse bone marrow as previously described (26), and eosinophils were derived from culture of mouse bone marrow as previously described (27). cDNA was prepared as described previously (28). The expression levels of ST3Gal-III, Fuc-TIV, and Fuc-TVII were determined by quantitative PCR (qPCR) using an Mx3000P qPCR system (Agilent Technologies, Santa Clara, CA). The primers and probes were designed by Origene Technologies (Rockville, MD). Data were quantitated by the comparative threshold cycle method after normalization with the value of endogenous GAPDH gene expression as described elsewhere (28). Data are expressed as the relative quantitation values compared with the expression without stimulation. Airway responsiveness to methacholine was assessed 24 h after the final OVA challenge in intubated and ventilated mice (flexiVent ventilator; Scireq, Montreal, QC, Canada) anesthetized with ketamine (100 mg/kg) and xylazine (10 mg/kg) i.p. as previously described (10). The dynamic airway resistance was determined using Scireq software in mice exposed to nebulized PBS and methacholine (3, 24, and 48 mg/ml). The following ventilator settings were used: tidal volume (10 ml/kg), frequency (150/min), positive end-expiratory pressure (3 cmH2O). Unless otherwise specified, ANOVA and an unpaired Student t test (two-tailed) were used for statistical evaluation of the results. A p value <0.05 was considered statistically significant. All results are shown as means ± SEM. We have previously used immunohistochemistry to demonstrate that Siglec-F ligands are expressed in the WT lung in epithelial cells and peribronchial inflammatory cells (10). In this study we have used FACS as an improved quantitative method (compared with immunohistochemistry) to assess whether Siglec-F ligands are constitutively or inducibly expressed on cell types in the lung other than epithelial cells and macrophages important to asthma (i.e., mast cells, eosinophils, T cells, neutrophils), and whether stimuli (allergen, Th2 cytokines, TLR ligands) and enzymes (ST3Gal-III, Fuc-TIV/VII) regulating Siglec-F ligand formation in these cells are similar or different. Using single-cell suspensions derived from lungs of naive WT mice, we demonstrated by FACS that nonepithelial cells such as eosinophils, macrophages, and mast cells all expressed significant levels of constitutive Siglec-F ligand (Fig. 1A, left panel) whereas neutrophils expressed much lower levels of constitutive Siglec-F ligand (Fig. 1A, left panel). Among the naive WT mouse lung cells tested, eosinophils showed the highest level of constitutive expression. Naive WT mouse lung CD4+ cells, CD8+ cells, and B cells did not express Siglec-F ligands (data not shown). Peripheral blood eosinophils from naive WT mice also expressed significant levels of constitutive Siglec-F ligand (Fig. 1A, right panel). In contrast, neither peripheral blood neutrophils (Fig. 1A, right panel), CD4+ cells, CD8+ cells, or B cells (data not shown) from naive WT mice expressed Siglec-F ligand. FACS detection of Siglec-F ligands in naive WT, ST3Gal-III+/−, and Fuc-TIV−/−/VII−/− lung cells. (A) Expression of Siglec-F ligands on naive WT lung and blood cells. Inflammatory cells from both mouse lungs (eosinophils, macrophages, mast cells, and neutrophils) and peripheral blood (eosinophils and neutrophils) were analyzed by flow cytometry for Siglec-F ligand expression. Individual cell types in these lung single-cell digests and peripheral blood were not purified prior to FACS analysis. Shaded area shows the staining with control human IgG, and black lines show the staining on cells from WT mice. Data are representative of three separate mice showing similar results. (B) Expression of Siglec-F ligands on naive WT, ST3Gal-III+/−, and Fuc-TIV−/−/VII−/− mouse primary airway epithelial cells. Shaded area shows the staining with control human IgG, and black lines show the staining on cells from WT mice. Red lines show the expression on ST3Gal-III+/− or Fuc-TIV−/−/VII−/− mice as indicated in the figure. Data are representative of three separate experiments using three different lots of epithelial cells showing similar results. (C) Expression of Siglec-F ligands on cell surface of mouse lung cells. Shaded area shows the staining with control human IgG, and black lines show the staining on cells from WT mice. Red lines show the expression on ST3Gal-III+/− or Fuc-TIV−/−/VII−/− cells. Data are representative of three separate mice showing similar results. (D) Relative quantitation values for ST3Gal-III, Fuc-TIV, and Fuc-TVII mRNAs assessed by qPCR in WT primary airway epithelial cells (EP), bone marrow–derived macrophages (Mac), and bone marrow–derived eosinophils (Eos). Data are the means ± SEM (n = 3). To examine whether either sialyltransferases and/or fucosyltransferases were important to the expression of constitutive Siglec-F ligand in lung epithelial cells, we isolated primary lung tracheal epithelial cells (>98% pure as assessed by cytokeratin immunostaining) from naive mice (WT, ST3Gal-III+/−, and Fuc-TIV−/−/VII−/−) (Fig. 1B). Naive WT mouse epithelial cells had significant surface expression of Siglec-F ligand as assessed by flow cytometry (Fig. 1B). In contrast, Siglec-F ligand expression on epithelial cells from naive ST3Gal-III+/− heterozygote mice was almost completely absent (Fig. 1B, left panel). Homozygous ST3Gal-III null mice were not used because they are difficult to breed and develop neurodegenerative disease. Naive Fuc-TIV−/−/VII−/− epithelial cells showed a slight decrease in levels of surface Siglec-F ligand expression (Fig. 1B, right panel). These studies suggest that in naive mouse epithelial cells, ST3Gal-III plays a major role in constitutive Siglec-F ligand synthesis, whereas Fuc-TIV/VII partially contributes to constitutive Siglec-F ligand synthesis. It is particularly notable that even a heterozygous haploinsufficiency of ST3Gal-III is sufficient to markedly reduce constitutive Siglec-F ligand production. In contrast to epithelial cells derived from naive ST3Gal-III+/− mice in which levels of constitutive Siglec-F ligand were nearly completely absent (Fig. 1B), levels of constitutive Siglec-F ligand were only partially reduced in lung eosinophils, macrophages, and mast cells derived from naive ST3Gal-III+/− mice (Fig. 1C, left panel). Levels of constitutive Siglec-F ligand expression were also partially reduced in naive Fuc-TIV−/−/VII−/− mouse lung macrophages, mast cells, and eosinophils (Fig. 1C, right panel). These studies suggest that there are differences between lung epithelial cells compared with eosinophils, macrophages, and mast cells in the requirement for ST3Gal-III in constitutive Siglec-F ligand synthesis in heterozygous ST3Gal-III+/− mice, with lung epithelial cells not expressing any constitutive Siglec-F ligand in heterozygous ST3Gal-III+/− mice, whereas lung eosinophils, macrophages, and mast cells had reduced but not absent constitutive Siglec-F ligand synthesis in heterozygous ST3Gal-III+/− mice. Lung epithelial cells as well as lung eosinophils, macrophages, and mast cells use Fuc-TIV/VII to a similar degree to partially contribute to constitutive Siglec-F ligand synthesis. Similar results were noted with peripheral blood eosinophils compared with lung eosinophils in their partial requirements for ST3Gal-III and Fuc-TIV/VII to synthesize constitutive Siglec-F ligands (data not shown). We examined whether differences in levels of expression of the enzyme ST3Gal-III in naive WT mouse lung epithelial cells compared with macrophages and eosinophils could explain the difference in requirement for ST3Gal-III in constitutive Siglec-F ligand synthesis in the different cell types. Levels of ST3Gal-III as assessed by qPCR were highest in macrophages, with lower levels in eosinophils and the lowest levels in epithelial cells (Fig. 1D). Similarly, levels of Fuc-TIV and Fuc-TVII were highest in eosinophils and macrophages compared with epithelial cells (Fig. 1D). Although WT naive epithelial cells expressed the lowest level of ST3Gal-III and had the greatest reduction in expression of Siglec-F ligand detected in ST3Gal-III+/− mice (compared with macrophages and eosinophils), these correlative studies are unable to determine whether this accounts for the continued Siglec-F ligand expression in ST3Gal-III+/− mice by macrophages and eosinophils who have higher levels of ST3Gal-III expression. Because the constitutive expression of Siglec-F ligands by the lung epithelial MLE-12 cell line was very high and stable (Fig. 2A), we used this lung epithelial cell line to examine whether incubating MLE-12 cells with sialidase would reduce Siglec-F ligand expression, and whether recovery of Siglec-F ligand expression would be influenced by cytokines and TLR ligands. Incubation of MLE-12 cells with sialidase significantly reduced Siglec-F ligand expression as assessed by FACS (Fig. 2A). Siglec-F ligand expression recovered gradually several hours after removing the sialidase, and by 12 h, Siglec-F ligand expression levels approximated those without sialidase treatment (Fig. 2A). Incubation of MLE-12 cells with either Th2 cytokines (IL-4, IL-13) (Fig. 2B, 2D), GM-CSF (Fig. 2B, 2D), or TLR ligands (CpG, LPS, Pam3) (Fig. 2C) accelerated the recovery of Siglec-F ligand expression on MLE-12 cells at 6 h after incubation with sialidase was ended. In contrast, neither IL-10 nor IL-17 influenced levels of Siglec-F ligand expression (Fig. 2B, 2D). Similar to results with the MLE-12 cell line, Th2 cytokines (IL-4, IL-13) and GM-CSF enhanced expression of Siglec-F ligand in studies of primary mouse lung epithelial cells (Fig. 2E). Siglec-F ligand expression on MLE-12 cells is upregulated by IL-4, IL-13, GM-CSF, and TLR ligands. (A) The expression of Siglec-F ligands on cell surface of MLE-12 cells at indicated times after sialidase treatment was analyzed by flow cytometry. Shaded area shows the staining with control human IgG, and dotted lines show the staining on MLE-12 without sialidase pretreatment. Data are representative of three separate experiments showing similar results. (B and C) Twenty-four hours after sialidase treatment, MLE-12 cells were stimulated with indicated cytokines or TLR ligands for 6 h and analyzed for Siglec-F ligand expression. Shaded area shows the staining with control human IgG, black lines show the staining on cells without stimulation, and red lines show the staining on cells after stimulation. Data are representative of three separate experiments showing similar results. (D) Quantitation of mean fluorescence intensity (MFI) of Siglec-F ligand expression in MLE-12 cells incubated either without stimulus (depicted as (−)) or incubated with individual cytokines (IL-4, IL-13, GM-CSF, IL-10, IL-17) or TLR ligands (CpG, LPS, Pam3). Specific MFI was calculated as percentage of FL2 MFI compared with control stain. Results are expressed as means ± SEM. *p < 0.05, **p < 0.01, ***p < 0.001 versus unstimulated (n = 6). (E) Twenty-four hours after sialidase treatment, primary lung epithelial cells were stimulated with indicated cytokines for 6 h and analyzed for Siglec-F ligand expression. Shaded area shows the staining with control human IgG, black lines show the staining on cells without stimulation, and red lines show the staining on cells after stimulation. Data are representative of three separate experiments showing similar results. We have previously demonstrated that in vivo administration of IL-4 or IL-13 to WT mice induces expression of Siglec-F ligands on airway epithelium and peribronchial cells as assessed by immunohistochemistry (10). These immunohistochemistry studies were not designed to phenotype the peribronchial cells expressing Siglec-F ligands, which we performed in this study utilizing FACS. Similar to the results of our in vitro experiments with IL-4 and IL-13 (Fig. 2B), these cytokines, when administered in vivo, upregulated Siglec-F ligand expression on lung epithelial cells (Fig. 3A). The level of Siglec-F ligand upregulation was equivalent in response to either IL-4 or IL-13. Siglec-F ligand expression on mouse lung cells is upregulated by intranasal administration of IL-4, IL-13, and A. alternata in a STAT6-dependent manner. (A and B) WT mice were intranasally challenged with control PBS, IL-4, or IL-13, and 24 h later, their lungs were digested and analyzed for Siglec-F ligand expression. Expression on (A) epithelial cells and (B) indicated cell types from mouse lungs is shown. Shaded area shows the staining with control human IgG, black lines show the staining on cells from mice with control PBS administration, and red lines show the staining on cells from mice with indicated cytokine challenges. Data are representative of three separate experiments showing similar results. (C and D) Both WT (C) and STAT6−/− (D) mice were intranasally administered A. alternata extract (100 μg/mouse), and 24 h later their airway epithelial cells were analyzed for Siglec-F ligand expression. Shaded area shows the staining with control human IgG, black lines show the staining on cells from mice with control PBS administration, and red lines show the staining on airway epithelial cells from mice with A. alternata challenge. Data are representative of two separate experiments showing similar results. We also examined whether IL-4 and IL-13 regulated expression of Siglec-F ligand expression in peribronchial cells in vivo. In naive WT mice, lung eosinophils and macrophages express constitutive high levels of Siglec-F ligands (Fig. 1A). Administration of either IL-4 or IL-13 significantly increased levels of Siglec-F ligands in both WT mouse lung eosinophils and macrophages (Fig. 3B). In naive WT mice, lung neutrophils express low levels of Siglec-F ligands (Fig. 1A), and lung T cells and B cells do not express significant levels of Siglec-F ligand (data not shown). However, administration of IL-4 in vivo slightly increased levels of Siglec-F ligand expression in WT mouse lung neutrophils as well as CD4+ T cells (Fig. 3B), but not in lung CD8+ T cells (Fig. 3B) or B cells (data not shown). In contrast to the ability of IL-4 or IL-13 to upregulate expression of Siglec-F ligands in epithelial cells, macrophages, eosinophils, and CD4+ T cells, these cytokines did not upregulate expression of Siglec-F ligands in mast cells (which express significant constitutive levels of Siglec-F ligands in the lungs of naive WT mice) (Fig. 3B). Because Th2 cytokines such as IL-4 and IL-13 signal through STAT6 (29, 30), we next examined whether STAT6-deficient mice had reduced expression of Siglec-F ligands. In these studies we challenged naive WT mice on one occasion with a fungal allergen, A. alternata, which induces a significant innate airway eosinophil and Th2 response within 24 h (31). In comparison with control PBS-treated mice, A. alternata–challenged WT mouse airway epithelial cells showed increased Siglec-F ligand expression (Fig. 3C). In contrast, STAT6−/− mice challenged with A. alternata did not significantly upregulate Siglec-F ligand expression (Fig. 3D). Because naive ST3Gal-III+/− mice exhibit significant reductions in levels of Siglec-F ligand expression (Fig. 1B, 1C), we examined whether these mice would have alterations in levels of lung eosinophilic inflammation as noted in Siglec-F–deficient mice challenged with allergen (4). OVA allergen–challenged ST3Gal-III+/− mice exhibited a significantly greater increase in total BAL cells compared with WT mice (p < 0.05), as well as in BAL eosinophils (2.7-fold) (p < 0.05 versus WT) and BAL macrophages (2-fold) (p < 0.05 versus WT) (Fig. 4A). There was a modest increase in BAL lymphocytes (2.5-fold) and BAL neutrophils (1.4-fold) in ST3Gal-III+/− mice (Fig. 4A). In addition to increased BAL inflammation in ST3Gal-III+/− mice, OVA allergen–challenged ST3Gal-III+/− mice exhibited a significant increase in peribronchial inflammation assessed in H&E stained lung sections (Fig. 4B). MBP immunostaining of the lung sections showed significantly increased peribronchial eosinophil accumulation in ST3Gal-III+/− mice compared with WT mice (Fig. 4C). OVA-induced eosinophilic lung inflammation is exaggerated in ST3gal III+/− mice. (A) The numbers of BAL cells in WT mice (PBS, n = 4; OVA, n = 6) and ST3Gal-III+/− mice (PBS, n = 8; OVA, n = 7) immunized i.p. with OVA with aluminum hydroxide and sacrificed at 24 h after the last challenge are shown. Data show the means ± SEM. *p < 0.05, **p < 0.01, ***p < 0.001 versus the corresponding values for control mice; †p < 0.05 versus the indicated group. (B) H&E staining of the lung sections from WT mice and ST3Gal-III+/− mice. Scale bars, 100 μm. (C) MBP staining with DAPI staining of the lung sections from WT mice and ST3Gal-III+/− mice. Representative data for the mice used in (A) are shown. Original magnification ×200. (D) Airway responsiveness to methacholine was measured in non-OVA and OVA-challenged WT mice (no OVA, n = 4; OVA, n = 7) and ST3Gal-III+/− mice (no OVA, n = 3; OVA, n = 6). ***p < 0.01 WT OVA versus WT no OVA, p < 0.05 WT OVA versus ST3Gal-III+/− OVA. (E) Levels of BAL IL-5, IL-4, and CCL24 from WT mice (PBS, n = 8; OVA, n = 16) and ST3Gal-III+/− mice (PBS, n = 11; OVA, n = 14) are shown. *p < 0.05, ** p < 0.01 versus control PBS group. (F) Siglec F ligand expression on lung epithelial cells from WT mice is shown. Shaded area shows the staining with control human IgG, black lines show the staining on cells from control mice, and red lines show the staining on cells from OVA-treated mice. Data are representative of four separate mice showing similar results. (G) Siglec F ligand expression on lung epithelial cells and BAL eosinophils is shown. Shaded area shows the staining with control human IgG, black lines show the staining on cells from OVA-treated WT mice, and red lines show the staining on OVA-treated ST3Gal-III+/− mice. Data are representative of four separate mice showing similar results. The increased levels of BAL and peribronchial eosinophils in ST3Gal-III+/− mice were not due to increases in IL-5, as levels of IL-5 were less in ST3Gal-III+/− mice compared with WT mice (Fig. 4E). Levels of the eosinophil chemoattractant CCL24 were also not significantly different in ST3Gal-III+/− mice compared with WT mice (Fig. 4E). Although OVA-challenged ST3Gal-III+/− mice had increased lung eosinophilic inflammation compared with WT mice (Fig. 4A, 4B), they had less of an increase in airway hyperresponsiveness compared with WT mice challenged with OVA (Fig. 4D). Because OVA-challenged ST3Gal-III+/− mice have reduced levels of Th2 cytokines (IL-4, IL-5) (Fig. 4E), ST3Gal-III+/− mice may have immunological defects in T cells or non–T cells, which through reduced expression of cytokines/mediators effects smooth muscle contractility. Alternatively, ST3Gal-III+/− mice may have intrinsic smooth muscle defects in contractility. Expression levels of Siglec-F ligands on WT airway epithelial cells from lungs of OVA-treated mice were higher than after PBS challenge (Fig. 4F). However, Siglec-F ligand levels were reduced in ST3Gal-III+/− lung epithelial cells after OVA challenge (Fig. 4G, upper panel). Similarly, OVA-challenged ST3Gal-III+/− mouse eosinophils in BAL had reduced levels of Siglec-F ligand expression compared with WT eosinophils (Fig. 4G, lower panel). Because we have previously observed that the Siglec-F interaction with Siglec-F ligands mediates eosinophil apoptosis (4), we examined whether the decreased expression of Siglec-F ligands in ST3Gal-III+/− mice reduced the levels of apoptosis of lung eosinophils as assessed by TUNEL assay combined with MBP staining. OVA-challenged ST3Gal-III+/− mice had fewer peribronchial TUNEL+ lung cells compared with WT mice (Fig. 5A). The numbers of peribronchial cells that were TUNEL+ and MBP+ (expressed per total number of MBP+ peribronchial cells) were significantly lower in ST3Gal-III+/− mice challenged with OVA compared with OVA-challenged WT mice (Fig. 5B). These studies suggest there are fewer apoptotic eosinophils in ST3Gal-III+/− mice compared with WT mice challenged with allergen, although TUNEL staining may detect both apoptotic and necrotic cells. In addition to studies of lung eosinophil apoptosis, we also examined the in vitro viability of peripheral blood eosinophils from ST3Gal-III+/− mice compared with WT mouse eosinophils. The percentage of live eosinophils (stained negative for both annexin V and propidium iodide) was significantly higher in peripheral blood leukocyte cultures incubated with media alone in ST3Gal-III+/− compared with WT mice (Fig. 5C). Interestingly, addition of IL-5 to peripheral blood leukocyte cultures increased the percentage of live WT eosinophils, but it did not further increase the viability of ST3Gal-III+/− eosinophils (Fig. 5C). IL-5 receptor expression as assessed by FACS was equivalent in WT and ST3Gal-III+/− eosinophils from both peripheral blood and bone marrow (Fig. 5D). Finally, we cocultured naive WT peripheral blood leukocytes with primary airway epithelial cells from naive WT or ST3Gal-III+/− mice (Fig. 5E). Naive WT leukocytes cultured with naive ST3Gal-III+/− epithelial cells had significantly fewer apoptotic eosinophils compared with naive WT leukocytes cultured with naive WT epithelial cells (Fig. 5E). These data suggest that naive ST3Gal-III+/− epithelial cells (which have reduced Siglec-F ligand expression) induce less eosinophil apoptosis (Fig. 5E) and may thus account for the increased peribronchial eosinophilic inflammation we have noticed in vivo in ST3Gal-III+/− mice (Fig. 4C). However, in vivo lung epithelial cells expressing Siglec-F ligand may not be the only cells interacting with eosinophils to mediate Siglec-F induced eosinophil apoptosis, as nonepithelial cells (i.e., eosinophils, macrophages, mast cells, neutrophils) that express Siglec-F ligands in vivo may also interact with eosinophils to induce their apoptosis. ST3Gal-III+/− eosinophils showed less apoptosis compared with WT eosinophils. (A) Lungs from OVA-sensitized and -challenged mice were stained using anti-mouse MBP Ab followed by TUNEL staining. Representative data for the mice used in Fig. 4A are shown. Original magnification ×400. (B) Apoptotic eosinophils in (A) are quantitated and shown as percentages of total eosinophils. **p < 0.01 versus WT OVA group. (C) Peripheral blood cells from WT and ST3Gal-III+/− mice were incubated for 24 h with indicated concentrations of rmIL-5 followed by FACS analysis for live eosinophils (n = 4). Eosinophils stained for annexin V− and propidium iodide− cells were counted as live eosinophils and the percentages of live eosinophils are shown. Data show the means ± SEM. *p < 0.05 versus the control eosinophils without rmIL-5; †p < 0.05 versus the indicated group. (D) IL-5 receptor expression on blood and bone marrow eosinophils are shown. Shaded area shows the staining with control stain, black lines show the staining on cells from WT mice, and red lines show the staining on cells from ST3Gal-III+/− mice. Data are representative of three separate experiments showing similar results. (E) WT blood cells were cocultured with primary mouse epithelial cells isolated and cultured from WT or ST3Gal-III+/− mice. Twenty-four hours later, cells were collected and stained to detect live eosinophils and apoptotic eosinophils as described above. Data show the mean ± SEM (n = 3). *p < 0.05. In this study we have demonstrated by FACS that Siglec-F ligands are constitutively and inducibly expressed in vitro and in vivo in selected cell types in the lung (epithelial cells, eosinophils, macrophages, and mast cells, but not CD4, CD8, or B cells) in response to divergent stimuli, including innate stimuli (TLR ligands, Alternaria), Th2 cytokines (IL-4, IL-13), GM-CSF, and adaptive immune stimuli (OVA allergen). Additionally, we demonstrated the greater importance of the sialyltransferase ST3Gal-III compared with the fucosyltransferases Fuc-TIV/VII in the synthesis of the constitutive and inducible Siglec-F ligands by lung epithelial and nonepithelial cells (eosinophils, macrophages, mast cells). Finally, we demonstrated that ST3Gal-III– deficient mice (deficient in expression of Siglec-F ligands) have significantly enhanced OVA-induced allergic airway inflammation associated with reduced eosinophil apoptosis. The reduced eosinophil apoptosis in the lung is likely mediated by reduced epithelial expression of Siglec-F ligands, as WT eosinophils (which highly express Siglec-F) when cultured with ST3Gal-III–deficient epithelial cells (which do not express Siglec-F ligand) have reduced eosinophil apoptosis compared with WT eosinophils cultured with WT epithelial cells. We previously reported using immunohistochemistry that airway epithelia and peribronchial mononuclear leukocytes expressed Siglec-F ligands (4, 10). In this study, we have extended these results using an alternate method, flow cytometry, to phenotype and quantitate whether additional immune and inflammatory cells in the lung important to asthma (i.e., mast cells, T cells, B cells, neutrophils) express Siglec-F ligands. Our FACS studies of WT naive lung cells demonstrated that not only epithelial cells, as well as peribronchial mononuclear leukocytes as previously demonstrated (4, 10), but also lung macrophages, eosinophils, and mast cells expressed significant levels of constitutive Siglec-F ligands. 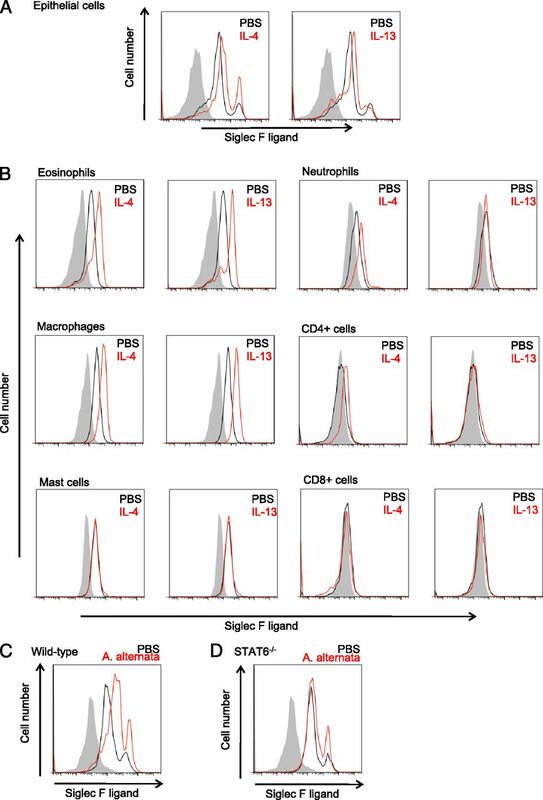 In contrast, T cells (CD4, CD8) and B cells did not express significant constitutive Siglec-F ligands, whereas neutrophils in the lung but not peripheral blood expressed low levels of Siglec-F ligands. These studies demonstrate that similar to constitutive Siglec-F expression, constitutive Siglec-F ligand expression is restricted to particular cell types. Interestingly, there are thus mouse lung cells important to allergic inflammation and asthma that constitutively coexpress both Siglec-F and Siglec-F ligands (macrophages, eosinophils). In contrast, there are also lung cells that either constitutively only express the Siglec-F ligand (epithelial cells, mast cells, and low levels by neutrophils) or, alternatively, constitutively express neither Siglec-F or its ligand (CD4, CD8, B cells). In addition to constitutive Siglec-F ligand expression, in this study we demonstrate that Siglec-F ligand expression can be regulated not only by adaptive stimuli (OVA allergen) and Th2 cytokines (IL-4, IL-13) as previously demonstrated (4, 10), but also within 24 h by innate immune stimuli (Alternaria), TLR ligands (TLR2, TLR4, and TLR9), and GM-CSF. Interestingly, CD4 cells that do not express constitutive Siglec-F could be induced to express low levels of Siglec-F ligands following stimulation with IL-4. Enzymes responsible for Siglec-F ligand formation have not yet been clearly delineated, and it seems likely that a series of enzymatic reactions are necessary for its formation. Sequential steps in the biosynthesis of 6′-sulfo-SLeX, a structurally resembling glycan to the Siglec-F ligand 6′-sulfo-SLex, have been investigated using human bronchial mucosa (12). These studies demonstrated the following sequential steps: 1) sulfation by 6-sulfotransferases, 2) β-galactosylation, 3) α-2,3 sialylation by sialyltransferases, and 4) α-1,3 fucosylation by fucosyltransferases (12). In this study we have used ST3Gal-III+/− and FucTIV/VII-deficient mice to examine the role of these enzymes in the third and fourth steps of Siglec-F ligand formation. ST3Gal-III has previously been identified based on immunohistochemistry of lungs derived from non-allergen–challenged naive ST3Gal-III–deficient mice as important in constitutive Siglec-F ligand formation (20). Our study extends these observations regarding the role of ST3Gal-III in Siglec-F ligand formation to demonstrate that different cell types (epithelial cells versus eosinophils, macrophages, mast cells) differ in their requirement for levels of ST3Gal-III needed for constitutive Siglec-F ligand formation in ST3Gal-III+/− mice. For example, lung epithelial cells from mice heterozygously deficient in ST3Gal-III exhibit complete loss of expression of Siglec-F ligands as assessed by FACS. In contrast, eosinophils, macrophages, and mast cells from mice heterozygously deficient in ST3Gal-III have only a partial reduction in Siglec-F ligand formation. Several factors may account for the difference in requirements for ST3Gal-III in Siglec-F ligand formation in the cell types we have studied, including differences in levels of expression of ST3Gal-III, differences in levels of sialyltransferases other than ST3Gal-III, as well as the fact that we have studied ST3Gal-III heterozygotes rather than homozygous-deficient mice. In terms of expression levels of ST3Gal-III as assessed by qPCR, they were lowest in epithelial cells, the cell type in which constitutive Siglec-F ligand formation was most reduced in heterozygous deficient ST3Gal-III mice. Although both macrophages (>32-fold increase in ST3Gal-III mRNA compared with epithelium) and eosinophils (>3-fold increase in ST3Gal-III mRNA compared with epithelium) had increased levels of ST3Gal-III mRNA compared with epithelium, it is possible that these differences in endogenous ST3Gal-III mRNA may or may not explain the difference in requirement for constitutive Siglec-F ligand formation in ST3Gal-III heterozygotes. Alternatively, a sialyltransferase other than ST3Gal-III could be important in Siglec-F ligand formation in macrophages, eosinophils, and mast cells, but not in epithelial cells. In this regard, there are >15 sialyltransferases in mice, with ST3Gal-II, -III, -IV, and -V among the α-2,3 sialyltransferases found to be expressed in mouse lungs (17). We used ST3Gal-III+/− heterozygous mice rather than ST3Gal-III−/− mice, as the homozygous ST3Gal-III−/− mice are difficult to breed and they develop neurodegenerative disease. Nevertheless, our studies with ST3Gal-III+/− mice demonstrated an interesting difference in requirement for this enzyme in constitutive Siglec-F ligand synthesis in epithelium compared with nonepithelial cells that will require further investigation. In contrast to constitutive Siglec-F ligand synthesis, OVA-induced Siglec-F ligand synthesis in ST3Gal-III+/− mice was significantly but not completely inhibited in epithelial cells. We also examined the role of fucosyltransferases in the expression of Siglec-F ligands. These studies demonstrated that mice deficient in both Fuc-TIV and Fuc-TVII had a very modest reduction in Siglec-F ligand formation in both epithelial cells and nonepithelial cells. Further studies are thus needed in identifying the enzymes necessary for Siglec-F ligand formation. In addition to demonstrating an important role for ST3Gal-III in constitutive and induced Siglec-F ligand formation, we also demonstrated that ST3Gal-III+/− mice showed exaggerated eosinophilic lung inflammation in a model of OVA-induced eosinophilic lung inflammation. Because crosslinking Siglec-F induces eosinophil apoptosis (4), we explored whether ST3Gal-III+/− mice (which express reduced levels of Siglec-F ligands) had reduced levels of eosinophil apoptosis. These studies demonstrated that OVA-challenged ST3Gal-III+/− mice had a reduced number of apoptotic eosinophils and more live eosinophils. The reduced eosinophil apoptosis in the lungs of ST3Gal-III+/− mice may be mediated by reduced epithelial expression of Siglec-F ligands, as WT eosinophils (which highly express Siglec-F) when cultured with ST3Gal-III–deficient epithelial cells (which do not express Siglec-F ligand) have reduced eosinophil apoptosis compared with WT eosinophils cultured with WT epithelial cells. In summary, our studies demonstrated that Siglec-F ligands are constitutively expressed in vitro and in vivo in selected cell types in the lung (epithelial cells, eosinophils, macrophages, mast cells, and neutrophils, but not CD4, CD8, or B cells) and induced in response to divergent stimuli, including innate stimuli (TLR ligands, Alternaria), Th2 cytokines (IL-4, IL-13), GM-CSF, and adaptive immune stimuli (OVA allergen). Additionally, studies of mutant mice (ST3Gal-III, Fuc-TIV/VII) demonstrated the greater importance of the sialyltransferase ST3Gal-III compared with fucosyltransferases Fuc-TIV/VII in the synthesis of the constitutive and inducible Siglec-F ligands by lung epithelial and nonepithelial cells. ST3Gal-III–deficient mice (deficient in expression of Siglec-F ligands) had significantly enhanced OVA-induced eosinophilic airway inflammation associated with reduced eosinophil apoptosis. 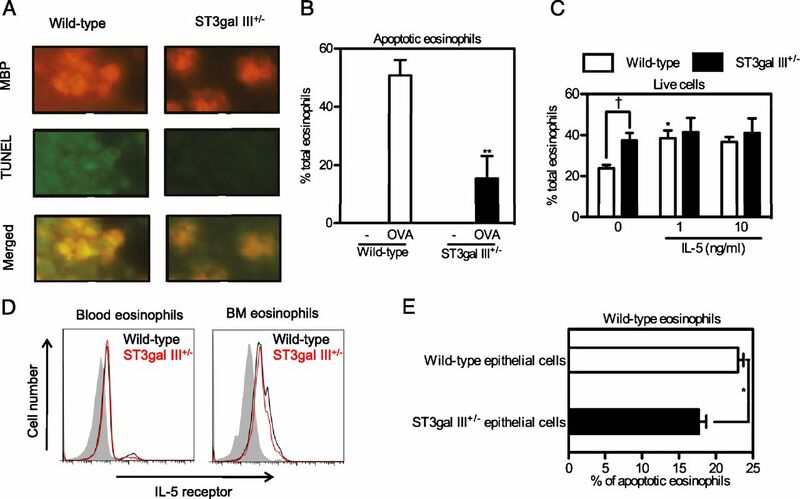 The reduced eosinophil apoptosis in the lung of ST3Gal-III–deficient mice may be mediated by reduced epithelial expression of Siglec-F ligands as WT eosinophils (which highly express Siglec-F) when cultured with ST3Gal-III–deficient epithelial cells (which do not express Siglec-F ligand) had reduced eosinophil apoptosis compared with WT eosinophils cultured with WT epithelial cells. Overall, these studies demonstrate that ST3Gal-III plays an important role in Siglec-F ligand formation and eosinophil apoptosis with resultant effects on eosinophilic inflammation in the lung. However, additional as yet undetermined enzymes are also likely to play an important role in Siglec-F ligand formation. This work was supported by National Institutes of Health Grants AI 38425, AI 70535, AI 72115 (to D.B. ), and P01HL107150 (to A.V.) and by Grants-in-Aid for Young Scientists (B) from the Ministry of Education, Culture, Sports, Science, and Technology, Japan (to M.S.). M.S. is a Postdoctoral Fellow supported by a Postdoctoral Fellowship for Research Abroad from the Japan Society for the Promotion of Science.
. 2007. Siglecs and their roles in the immune system. Nat. Rev. Immunol. 7: 255–266.
. 2001. Cloning and characterization of a novel mouse Siglec, mSiglec-F: differential evolution of the mouse and human (CD33) Siglec-3-related gene clusters. J. Biol. Chem. 276: 45128–45136.
. 2000. Immune inhibitory receptors. Science 290: 84–89.
. 2007. Defining the in vivo function of Siglec-F, a CD33-related Siglec expressed on mouse eosinophils. Blood 109: 4280–4287.
. 2009. Anti-Siglec-F antibody reduces allergen-induced eosinophilic inflammation and airway remodeling. J. Immunol. 183: 5333–5341.
. 2009. Anti-Siglec-F antibody inhibits oral egg allergen induced intestinal eosinophilic inflammation in a mouse model. Clin. Immunol. 131: 157–169.
. 2003. Ligation of Siglec-8: a selective mechanism for induction of human eosinophil apoptosis. Blood 101: 5014–5020.
. 2005. Mechanism of Siglec-8-induced human eosinophil apoptosis: role of caspases and mitochondrial injury. Biochem. Biophys. Res. Commun. 336: 918–924.
. 2005. 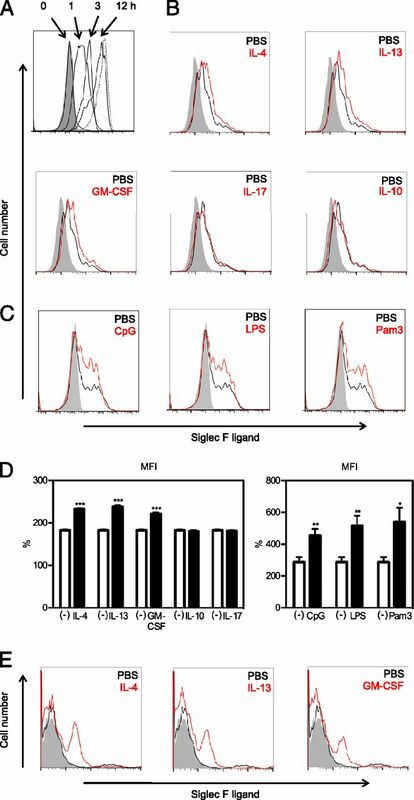 Mouse Siglec-F and human Siglec-8 are functionally convergent paralogs that are selectively expressed on eosinophils and recognize 6′-sulfo-sialyl Lewis X as a preferred glycan ligand. Glycobiology 15: 1125–1135.
. 2010. Chronic OVA allergen challenged Siglec-F deficient mice have increased mucus, remodeling, and epithelial Siglec-F ligands which are up-regulated by IL-4 and IL-13. Respir. Res. 11: 154.
. 1996. 6′-Sulfo sialyl LeX but not 6-sulfo sialyl LeX expressed on the cell surface supports L-selectin-mediated adhesion. J. Biol. Chem. 271: 27213–27216.
. 1999. Sequential biosynthesis of sulfated and/or sialylated Lewis X determinants by transferases of the human bronchial mucosa. Glycobiology 9: 1199–1211.
. 2010. Sialyl Lewis X modification of the epidermal growth factor receptor regulates receptor function during airway epithelial wound repair. Clin. Exp. Allergy 40: 607–618.
. 1989. Glycosyltransferases: structure, localization, and control of cell type-specific glycosylation. J. Biol. Chem. 264: 17615–17618.
. 1998. Structure, function and metabolism of sialic acids. Cell. Mol. Life Sci. 54: 1330–1349. 2008. Characterization of mouse sialyltransferase genes: their evolution and diversity. Biosci. Biotechnol. Biochem. 72: 1155–1167.
. 1999. Quantitative analysis of expression of mouse sialyltransferase genes by competitive PCR. Biochem. Biophys. Res. Commun. 260: 23–27.
. 1993. Expression cloning of a novel Gal β(1-3/1-4) GlcNAc α2,3-sialyltransferase using lectin resistance selection. J. Biol. Chem. 268: 22782–22787.
. 1999. Molecular cloning of a novel α2,3-sialyltransferase (ST3Gal VI) that sialylates type II lactosamine structures on glycoproteins and glycolipids. J. Biol. Chem. 274: 11479–11486.
. 2011. Characterization of expression of glycan ligands for Siglec-F in normal mouse lungs. Am. J. Respir. Cell Mol. Biol. 44: 238–243.
. 2001. 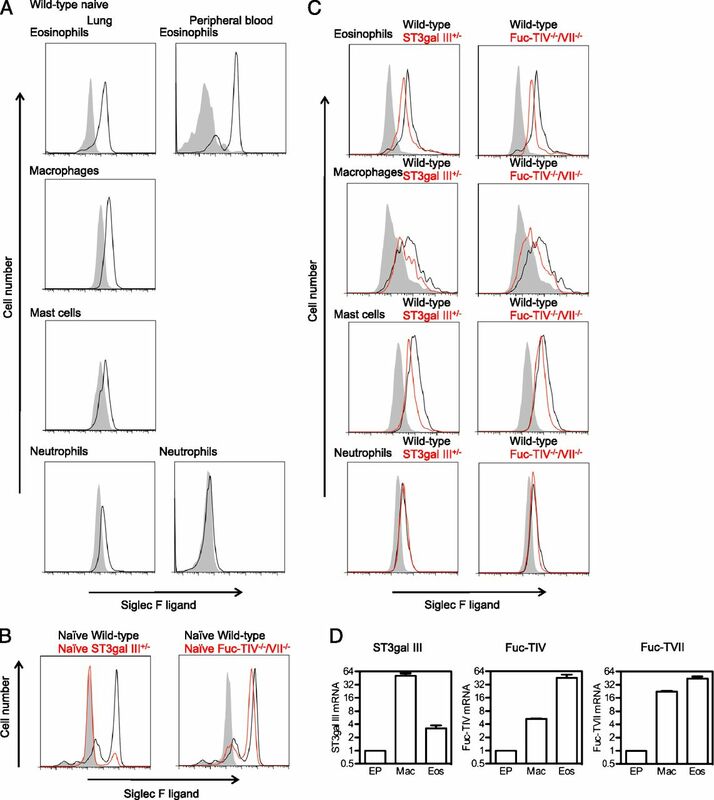 The α(1,3)fucosyltransferases FucT-IV and FucT-VII exert collaborative control over selectin-dependent leukocyte recruitment and lymphocyte homing. Immunity 15: 115–126.
. 2007. Mast cell-derived TNF contributes to airway hyperreactivity, inflammation, and TH2 cytokine production in an asthma model in mice. J. Allergy Clin. Immunol. 120: 48–55.
. 2009. Adiponectin and functional adiponectin receptor 1 are expressed by airway epithelial cells in chronic obstructive pulmonary disease. J. Immunol. 182: 684–691.
. 2012. Alternaria induces STAT6-dependent acute airway eosinophilia and epithelial FIZZ1 expression that promotes airway fibrosis and epithelial thickness. J. Immunol. 188: 2622–2629.
. 2008. Serial culture of murine primary airway epithelial cells and ex vivo replication of human rhinoviruses. J. Immunol. Methods 339: 264–269.
. 2004. Immunostimulatory DNA reverses established allergen-induced airway remodeling. J. Immunol. 173: 7556–7564.
. 2009. Generation of eosinophils from unselected bone marrow progenitors: wild-type, TLR- and eosinophil-deficient mice. Open Immunol. J. 2: 163–167.
. 2011. Leptin enhances survival and induces migration, degranulation, and cytokine synthesis of human basophils. J. Immunol. 186: 5254–5260.
. 1996. Stat6 is required for mediating responses to IL-4 and for development of Th2 cells. Immunity 4: 313–319.
. 1996. IL-4 and IL-13 activate the JAK2 tyrosine kinase and Stat6 in cultured human vascular endothelial cells through a common pathway that does not involve the γc chain. J. Clin. Invest. 98: 604–609.
. 2005. A new mouse model of lung allergy induced by the spores of Alternaria alternata and Cladosporium herbarum molds. Clin. Exp. Immunol. 139: 179–188.